Concept design for experiential proposal. Closer-up view of concept design. Some concept boards are developed closely with the director/s. This paper-folding-into-airplane-and-throwing contraption was created with Bob Partington for a Delta Airlines concept. Isometric architecture design with overall color definition. Schematic concept for experiential design. Beam me up. This isometric projection is a detail for a larger installation. The entire machine was envisioned as a metaphorical story of natural gas production. Color added to a schematic. No animals were harmed in the making of this image. Rube-Goldberg concept developed with director Aaron Duffy. Tells the story of the race between a new Chrome browser and a falling boot as documented by a very fast camera. Concept translated from thumbnails for director Asif Mian. Some directors will provide early sketches for ideas. My role in this process might be to translate, embellish, or help refine the details. The pairing of incongruous elements can add a playful twist to a client communication. This drawing was one of various concepts developed for a Cadillac luxury line. Dimetric color concept for a PSA about water consumption for director Gabe Askew. Isometric of a shock-absorber-testing facility-- with the replacement of the auto by a prim and proper dinner table setting. From a sketch by director Asif Mian. Detailed drawings can serve as technical cheat sheets for construction of miniatures and practical sets. This tabletop concept summarizes several days of exploration of individual elements for a spot directed by Peter Sluszka. 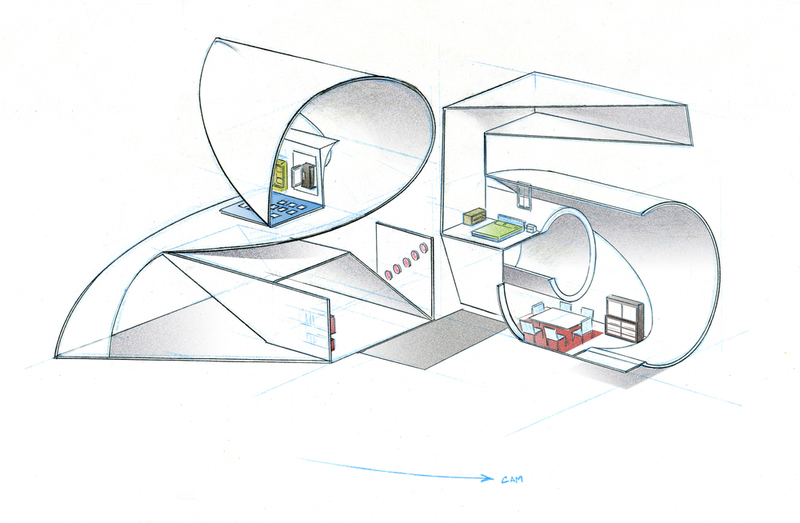 Schematic cutaway of an architectural space, showing the relative layout of various gags for a proposed stop-motion piece. Schematics can aid in the element-by-element exploration of larger designs. This drawing represents a sequence within a crazy complex Rube-Goldberg. Even once construction on a set gets underway, drawings can still help the team troubleshoot difficult areas. Composite drawings show a full layout of a design in all its glorious imperfections. Space equipment explorations for an indie filmmaker.